Hidden explosives are among the concerns at BWI/Marshall Airport, and that's where the TSA's passenger-screening canines come in. The explosive-sniffing dogs can identify numerous potentially dangerous substances from several feet away. The dogs showed of their talents to sniff out dangerous contraband. Watch the video. BALTIMORE — With next week marking the anniversary of the death of Osama Bin Laden, and the busy summer travel season also about to get underway, the Transportation Security Administration says it’s being vigilant over possible threats. As is the case at other airports, hidden explosives are among the concerns at BWI/Marshall Airport, and that’s where the TSA’s passenger-screening canines come in. The explosive-sniffing dogs can identify numerous potentially dangerous substances from several feet away. TSA officials demonstrated the dogs’ ability to sniff out that dangerous contraband Wednesday. The dogs are rewarded with praise and a toy when they alert their handler to something. Security concerns have already caused other changes for travelers, who must now take larger electronic devices out of carry-on bags at checkpoints. Officers have also been telling travelers to remove items from jam-packed bags in order to get a better view at their contents using X-ray machines. The dogs can help speed up checkpoint lines, according to the TSA. Occasionally, they do give false alerts over items like certain heart medicines, said handler Scott Baibos, who was scanning the airport with his dog, Bigi, another German shorthaired pointer. The TSA points out these dogs are not trained for drug detection or other patrol duties. 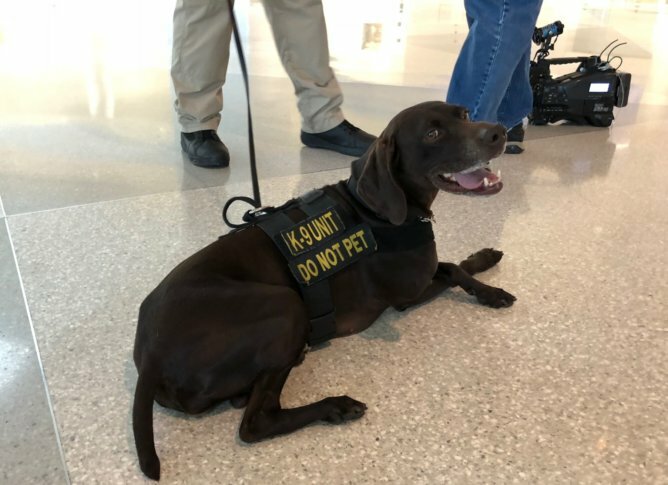 The agency has about 1,000 explosive-detection canines nationwide, including about five at BWI/Marshall, according to TSA spokesperson Lisa Farbstein. Amid the threats, the dog teams are especially valuable because they can be rapidly deployed to any part of the airport at any time, the TSA says.